Thank you for this post! I live in Las Vegas and yes, they are starting to have small flowers..I'll have to hide the pruners from myself so that I won't trim them! Love your blog! Great points – we often have 2 rose seasons in Abq, too, though our's don"t get thoroughly fried in summer dormancy, either. No mildew, not too-bad of water needs, and pretty amazing plants with just a little thought! Thank you so much for this "honesty" post. My roses are not so pretty these days either, and your photos and reassurance make me feel SO much better as a newbie to the desert! A useful post! Many of the roses in our neighborhood (Knockouts, natch) seem to be done blooming in Middle TN heat (low 90s most days). I don't grow any roses right now, but I do plan on adding some this autumn – either from the Earthkind series or maybe some Rugosas. It will be interesting to see how those fare in the Mid South heat. I thought the most useful advice was the part about NOT pruning off the damaged leaves in summertime. Sometimes it's important to know when to let a plant cope with adverse conditions on its own! Great post. This is my first year growing roses, and with all the work and money we invested in our 11 bushes, the sun burn was making me panic. We've got some sunshade up but think we need a little more. It's been118 to 120 this week and was 117 the first wweek of May! Those poor roses gave had a rough start! It is especially tough the first summer, but take heart – the more mature a rose is, the easier time it will have. So, next summer should be much better. They may look terrible, but those that make it through will survive to produce beautiful blooms! Thanks for this. My roses are looking like this and I couldn't find any sign of insects, etc. and could not imagine what was going on. What is going on is DROUGHT. I will refrain from cutting them off now. Thanks for that tip! I feel better now! Ohh and oops! Well, now I know. I bought a climbing rose that already had sunburned leaves.. it only had one flower and one bud on it at the time. Shortly after planting, the first bud bloomed and one more appeared, then bloomed very briefly and now it’s been a month with no more blooms. I had been trimming off the dead leaves regularly (thinking at first that they might be diseased)… well, now that I know better, I will resist… so glad to find this blog, thank you! I am glad that I was able to help. Roses definitely don’t look their best in summer but, are glorious in spring and fall. If you can give it some temporary shade from afternoon sun, that would be helpful until it grows larger. I have 4 tree roses, they are totally burnt from this AZ sun.. I have no shade from the morning until about 4 pm. Well except a couple umbrellas. Are my roses a goner or will they come back in the fall if I keep watering them? Thanks so much, have a good weekend. They should come back. You can also help protect them through the summer by adding a little shade. You can do this with shade cloth or landscape burlap. Keep watering and lightly prune them back in September to help rejuvenate them. 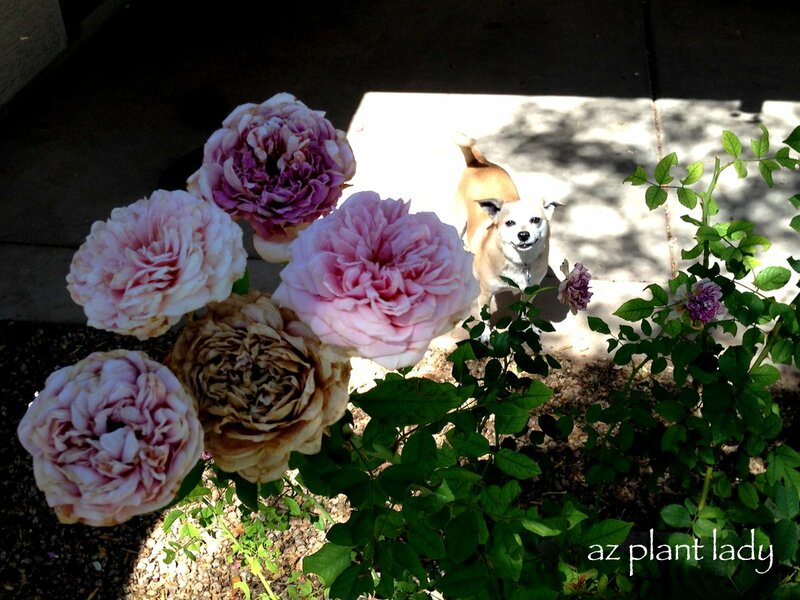 Yes, I grow roses in the desert! They do well here, and you are so right about us being lucky that our climate prevents 90% of the ills that usually befall roses in other areas. I have mostly David Austin, old roses (Damasks, Bourbons, etc.) and a few hybrid teas. Most of my roses get some late afternoon shade, but I have a few that get more sun and yes, they do get a little crispy this time of year – but bounce back nicely every time. My biggest problem has been not realizing that when David Austin says “grows 3-4′ tall and wide” in his catalog, he means in England. Oops. I now have a huge raised bed full of 8′-10′ monster English roses. Thanks for sharing your photos, which will undoubtedly comfort those new to roses here and also, may a say what a cute dog you have! 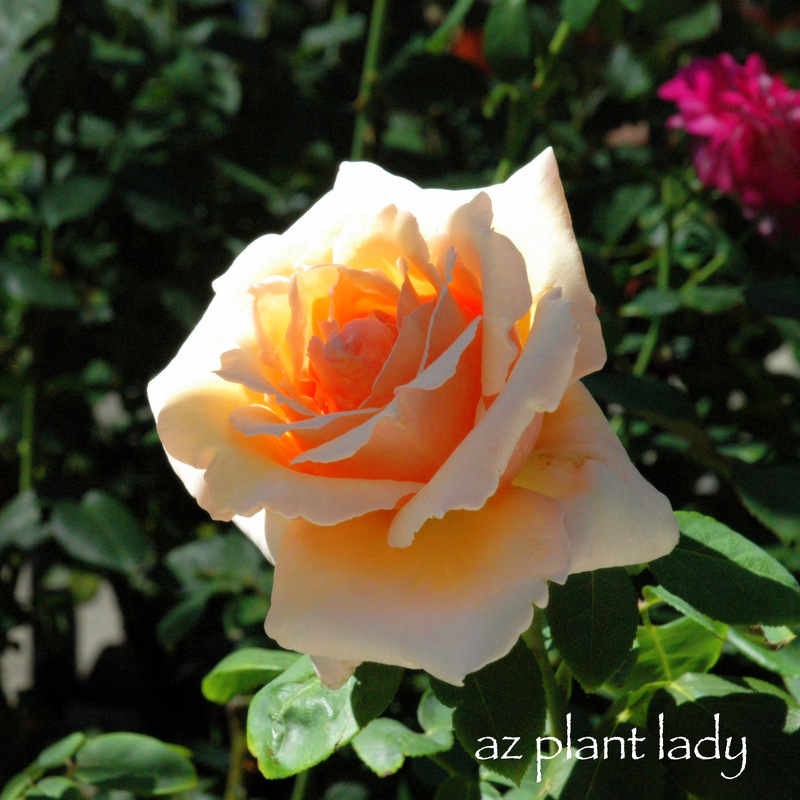 Thank you for sharing your experience growing roses in the desert. I met up with the folks at David Austin roses last week and shared how their new roses are faring in my garden. ‘Olivia Rose’ is one of their newer varieties and is thriving better than all of my others! My potted miniature roses are suffering from constant waves of spider mites the past month. AND they dont look good, very twiggy from so much leaf death. No matter how much neem oil and water I add to the pot, they keep coming back and I feel like I must remove the leaves to remove the mites! It sounds like quite a problem. If the spider mites were firmly established before you started treating them, then it will be harder to get rid of them. Miticides or insecticidal soap are effective, but must be reapplied. If most of the leaf is damaged, then remove it. I hope this helps! Hi and thanks for all the great info. I have a fairly new rose bush in a large pot on my patio. It was beautiful this spring when planted. I thought I was doing something wrong when my roses became small and leaves started turning brown. Now I know it’s normal here in AZ. Going out to buy a wheeled base for my pot so I can move it out of the sun in the afternoon. Glad I read your advice before cutting the brown leaves back. Should the roses be removed after blooming or leave them on as well? I have 3 small blooms presently. Thanks! Great question! Yes, keep the blooms on the bush. Removing them can stimulate your rose bush to try to form more, which simply puts more stress on it. Rest assured, it will look beautiful again in fall. I should have read this sooner. I garden at 4700 feet in Alamogordo, NM and have always had roses not do as well in summer but like you mention they flush in spring and fall. But here at this altitude they bloom still in summer. But this year we had higher than normal temps for longer than normal in July, with a lot of wind! This must have been a convection oven effect! Anyhow I kept cutting off the brown leaves and spent blooms. My worry is that my husband bought me 3 new roses in late spring (I normally only plant in the fall here. So those roses are looking so bad now. I did cover the 2 that look really bad with shade cloth. Should I use any plant food? They have barely any new growth and few leaves. Thanks! It has been a hard summer for the Southwest. It’s important NOT to prune when plants are struggling, since this makes things worse. They are struggling to survive and adding fertilizer will force them to try to grow flowers, diverting the resources the rose bush is using to survive. I would protect them with shade cloth and allow the brown leaves and spent blooms to remain, since they provide some protection from sun and wind. Hopefully, they will come back next summer. The first year after planting is the most crucial for plants. I have lost 3 rose bushes to a fungal infection each time. I bought them from Moon Valley Nursery here in Mesa. they said they would survive the summer heat. My neighbor who is a master gardener lost a.couple of rose bushes this year too. I have given up on growing roses here in Arizona and stick to succulents. It is a shame because I love them so much.